Today, the 7th of April, is exactly three months until my next big running challenge and my toughest marathon to date. The new Trail Verbier St Bernard marathon race takes place on Saturday 7th July between Liddes and Verbier, high in the Swiss Alps. With four ascents (the largest two of which are at the beginning and the end) and four descents, this marathon climbs 3,570m over the course of the 43.21km route. Back in 2014, I took part in the baby race of this series, a 2,500m ascent over 30km. Even the baby was a challenging experience (read all about the “Trails and Tribulations” here! ), with the obvious key take-out being the need to build more endurance in the legs to tackle those mountains. I’m quite used to building up the mileage to tackle a distance race around London but how do you train for such a series of climbs in a relatively flat area? Over the last two years I have found balancing my running with HIIT workouts to be a great way to not only improve my speed but also my strength and endurance – seemingly the perfect complement to an outdoor running programme – and hopefully the answer to this quandary (coupled with as much hill training as I can pack in around Richmond and the surrounding areas). With 13 weeks to go, I’m now a couple of months into my training programme. But as regulars to running will I’m sure sympathise, getting hill ready is currently the least of my worries, as I’ve recently sustained an injury to my ankle! I started physio this week and the problem is actually with my hips and glutes which are not strong enough (particularly on my right side), so my lower leg and ankle are having to compensate. I’m now tasked with a number of exercises which coupled with regular foam-rollering should hopefully see me able to build up the mileage more significantly over the coming weeks. While I work through my physio exercises to improve my hip strength and technique, I’ll continue to complement my running with a couple of HIIT workouts a week focused on building more endurance in my quads, glutes and arms, to hopefully help propel me up those mountains come July! There are a few morals to this story but the main one for me is accepting that nothing ever goes quite to plan when training for a marathon – in fact – when aiming for any goal in life… What’s important is how you respond to inevitable challenges along the way. Keep the faith that every mountain top is within reach if you just keep on climbing. Wishing all those taking part in the Paris Marathon (a favourite) and other Spring marathons this weekend, all the very best! Enjoy, and relish every mountainous moment. POINT3 is a new approach to mind and body fitness with the aim of inspiring people to move more mindfully and be their very best – in mind, body and soul. You can find out a little more about our vision and follow our journey on Instagram at point3wellbeing.com. In a couple of months I’ll say farewell to a fulfilling career in marketing to pursue this passion for fitness and wellbeing. Nicky, Sion and I (pictured above on our first ever shared run/happy experience three years ago) are all passionate about the benefits that fitness, mindfulness, nutrition and community have on both mental and physical wellbeing, and are keen to use our events experience of “bringing people together” to create a new way of life that has a positive effect on the management and prevention of stress. Follow our journey from start-up to push-up, and we look forward to sharing more details over the coming months. Just as I’ve become a bit of a part-time Bearcat Club runner, I’ve become a part-time blogger… not because I have no love for either, simply that life is busy and other things get in the way. But I need to finish the story that I started at the end of last year with my article in the Bearcat Winter Newsletter, when I embarked on this year’s running challenge – the Paris Marathon in April – and my fourth attempt at going under the 4 hour mark. The good news for those that don’t fancy reading this all the way through is that I succeeded! I completed the 42.2 kms around the stunning Paris streets in 3 hours 57 minutes and 12 seconds. More commonly applied in our work lives, it’s true that success does come from setting Specific, Measurable, Attainable, Relevant and Timely goals. I’ve always followed a training plan while working towards a marathon, but perhaps my goal hasn’t always been realistic, or I haven’t focused enough on a particular part of the programme to get the results I needed. This time around I was much more disciplined in my approach to my plan, and knowing my weaknesses are speed and strength, I signed up to some personal training at my local gym – The Training Works in St Margarets. I was told I was lucky to have James as my trainer as he’s in such high demand! And he didn’t disappoint. I signed up for a programme to kick-start my training through-out December and into January with the aim of increasing my running speed and efficiency. After an initial session where James assessed my overall condition, the areas we focused on were balance and core strength, my range of motion, and power and strength. Come February, my running training programme picked up pace and my PT programme came to a conclusion so I could focus solely on racking up the mileage. I’ve run a few races now which all help prepare you for what’s to come and the winter months of tough training. Early mornings in the dark, not to mention running in the cold and sometimes wet weather. 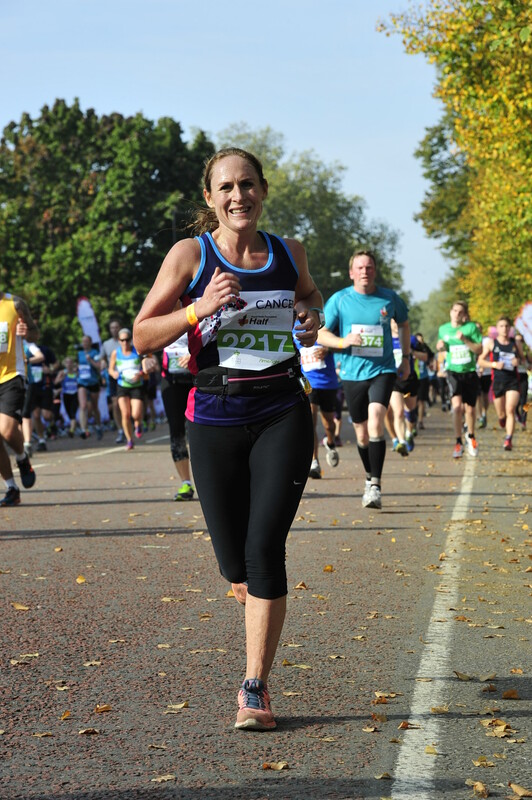 And with a few training races lined up – Hampton Court Half, and the Riverside 20 miler – and my focus on increasing my pace, I got stuck into my 18 week programme which culminated with race day on the 3rd April. I sat with Caitlin, founder of the Bearcats over lunch at Hei-Hing in Isleworth, and she reviewed my training plan based on much more experience than mine – she told me to be realistic about how many runs to do per week – I was starting a new job in January and she was right to suggest that this would impact on my training. So I cut my runs to four a week, whereas attempts before I would have typically run five or six times a week. She stressed it was about quality not quantity and to really concentrate on my speed work – with different types of interval training and hill training, if I was to dramatically improve my speed. Race day arrived and a gang of us from TRO (where I used to work) were running in memory of the late Tom Gentle – a friend and colleague who was taken from us tragically this time last year. The sun was shining and Paris looked spectacular. I was feeling confident knowing that I had prepared well and had taken on board all the great advice I’d received. I was focused on the job in hand. Everything seemed to go to plan. I felt strong throughout. I didn’t hit the wall. There was fabulous support out on the course and importantly, I enjoyed it! And 3 hours 57 minutes later I crossed the line knowing that everything had come together as planned/hoped. Sometimes it can take a number of attempts to succeed in what we want to achieve – and when we finally do, it’s all the sweeter for it. In my case, it was fourth time lucky. Thank you to the support crew of Nicky and the rest of the TRO crew who were there to support on the course and there to celebrate at the end. And to Tom Gentle – a great man who will never be forgotten. Download and read the full Newsletter here. While that might sound more like an introduction at a Bloggers Anonymous gathering, it’s true that I’ve neglected the blog since I ran the Paris Marathon back in April… mainly as I’ve been preoccupied with summer, work and a building project on my flat. But now that autumn’s here, and I’m settled back home, I thought I’d reflect on how my running has progressed since April. On 20th July, I started a 12-week running programme ahead of the Royal Parks Half Marathon, which I took part in last Sunday. My aim was to try and complete the 13.1 miles in 1:45 – previously my PB was 1:49 from March this year – so I was looking to shave a whole 4 minutes off my time. Straight away I seemed to be faster… and over the weeks I got stronger and faster still. 12 weeks, 380 miles, and 55 runs later I achieved my goal and more, by slipping under the 1:45 target with a 1:44:46 finish time and a new PB! All this goes to prove to me how valuable it is to give your body a rest every now and again, and also how important it is to build strength training into your running regime – to not only avoid injury, but to carve seconds off your race pace.